TORONTO, Oct. 31, 2012 /CNW/ - Excellon Resources Inc. (TSX: EXN) ("Excellon" or "the Company")is pleased to announce that it has commenced a 5,000 metres ("m") diamond drilling program on its DeSantis Project in Timmins, Ontario. 1.74 g/t gold over 12.0 m, including 10.39 g/t Au over 1.5 m in hole DS12-004. "We are very pleased with our technical progress at DeSantis since the completion of the last drilling campaign in April. The exploration team in Timmins has done a thorough job of compiling historical data and come up with several new target areas," stated John Sullivan, Vice-President of Exploration. "This regional approach has enabled the Company to see the project in a new light and we look forward to the results of this drilling program." 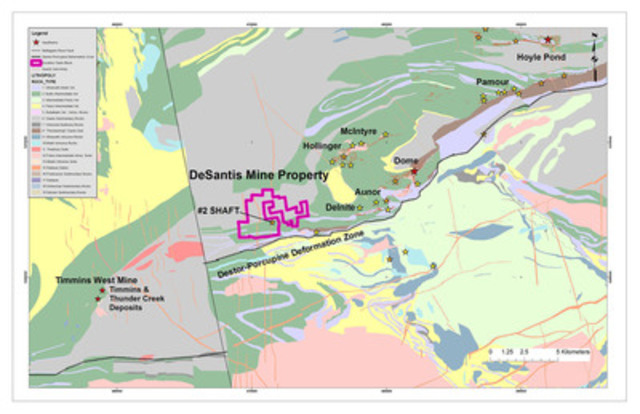 The DeSantis Project, which includes the past producing DeSantis Mine, covers approximately five km of strike length within the highly prospective geology of the Destor-Porcupine Deformation Zone ("DPDZ"), the main structure controlling gold deposits in the Timmins gold camp. The DeSantis Mine produced 35,800 ounces of gold from 178,650 tonnes of ore which graded 6.2 g/t Au during its intermittent production history. The property is located approximately 11 km west of Goldcorp Inc.'s Dome Mine and 14 km east of Lake Shore Gold Corp.'s Timmins Mine. 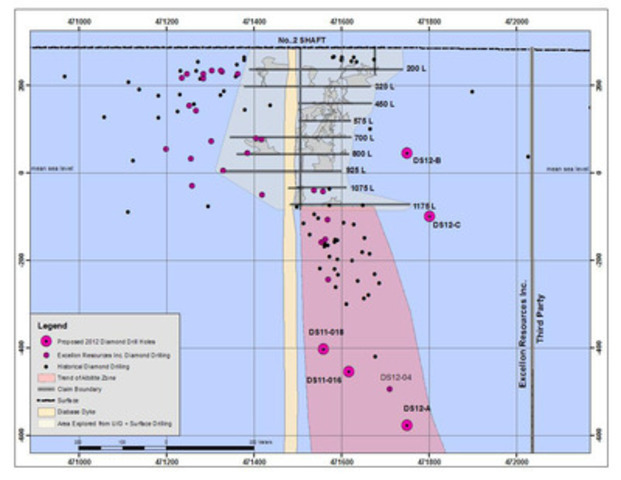 Exploration on the DeSantis Project since 2010 includes 5,888 m in 15 holes in 2010 and 27 holes (seven abandoned due to technical issues) totalling 11,039 m in 2011/2012. In mid-October the Company completed a comprehensive program of geotechnical compilation, relogging and sampling of recent and historic drill core and reviewing the project in a regional context. Based on the results of this work the Company commenced the current 5,000 m diamond drilling program in late October. Drilling will follow up on promising recent results and will test undrilled areas east of and below the known Albitite Zone. In addition, geophysical and geological targets will be tested in a series of holes on areas of the project that have not been thoroughly explored. Map 1 shows the location of the property in the Timmins Camp, while Map 2 is a longitudinal section showing the location of recent and planned drilling near the No. 2 shaft on both the Hydrothermal Alteration and Albitite zones. A winter 2013 drill program is being planned for the Company's 100%-owned Beschefer property, which is located approximately 60 km northeast of the Casa Berardi Mine, 80 km east-southeast of the Detour Gold Project and 12 km east of the past-producing Selbaie Mine. The property hosts the "B-14 Zone", which was discovered by Billiton Canada Inc. in 1995, but marginally explored prior to the Company's involvement. In early 2012, the Company completed 8,867 m of drilling in 33 holes focussed on the B-14 Zone. Significant intersections included 13.07 g/t Au over 8.75 m including 58.5 g/t Au over 1.50 m in hole BE12-014, and 10.35 g/t Au over 1.50 m and 3.56 g/t Au over 6.06 m in hole BE12-030. The B-14 Zone is found within a typical Archean volcanic assemblage, with gold hosted in pyritic quartz veining within a mylonitic unit. As the Beschefer property has little or no bedrock exposure and is muskeg-covered, drilling is most effectively performed during freezing conditions. Excellon is also pleased to announce that milling recommenced at the Company's mill in Miguel Auza, Zacatecas on October 29th. In the past few days, the Company trucked 1,800 tonnes of ore from its high-grade silver/lead/zinc La Platosa Mine in Durango, Mexico. An updated production forecast for the remainder of 2012 will be released in due course. The Company's DeSantis Project and Beschefer Property exploration programs are supervised by John Sullivan, B.Sc., PGeo., Excellon's Vice-President of Exploration and Stephen Conquer, B.Sc., PGeo., Excellon's Exploration Manager, Canada. Mr. Conquer is an economic geologist with over 30 years of experience in the mineral industry. Prior to joining Excellon he was Senior Project Geologist and Chief Mine Geologist for a company with gold exploration and mining operations in Timmins where he directed surface and underground exploration programs and the geological component of underground mining operations. Previously Mr. Conquer also held Chief Mine Geologist positions at operations near Sudbury and Marathon and senior exploration positions in the Abitibi and Red Lake Greenstone Belts.